The Daughters of the American Revolution (DAR) is a women's service organization dedicated to promoting historic preservation, education and patriotism, and to honoring the patriots of the American Revolution. The National Society Daughters of the American Revolution (NSDAR) was founded on October 11, 1890. The objectives, laid forth in the first meeting of the DAR, have remained the same for more than 125 years. ​ The Rockford Chapter NSDAR actively embraces our society's historical, educational and patriotic objectives. The Rockford Chapter NSDAR participates in Veterans Day activities, Memorial Day parades and other commemorative events. We provide support for local veterans. The chapter sponsors American History essay contests. 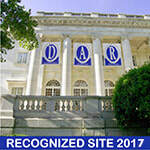 ​​ We also give the DAR Good Citizen Award to area high school students for academic excellence, patriotic citizenship and leadership skills. Additionally, the Rockford Chapter NSDAR provides 3 scholarships to area high school seniors. The Rockford Chapter NSDAR helps us remember and preserve our heritage by preserving native wildflowers at the Heritage Garden at Midway Village, giving books to the library, commemorating Flag Day and observing Constitution Week. We also mark patriot's graves, research our ancestors, as well as learn about and document our local history. Welcome reception for new citizens. The Rockford Chapter NSDAR welcomes new citizens at the Naturalization ceremonies held in Rockford, usually once or twice a year. We provide each new citizen with a small American flag, a copy of the Pledge of Allegiance and a copy of the flag code. After the ceremony we host a welcome reception for the new citizens and their families. The Rockford Chapter NSDAR has been welcoming new citizens every year for more than 50 years.